Maybe it’s my years watching Gilmore Girls (I am ONE DAY older than Rory Gilmore! 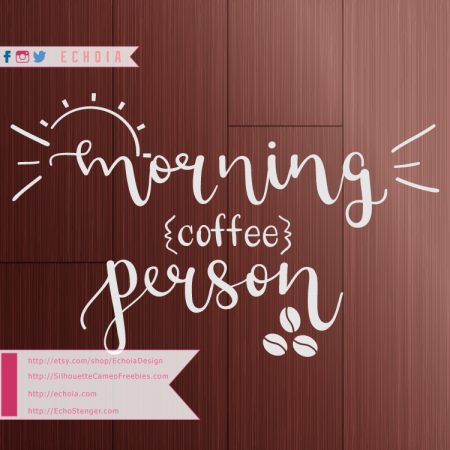 ), or my mom’s several-cups-a-day habit growing up, or the way that I love doughnuts, and the smell of coffee just seems so right with the smell of those delightful confections- I couldn’t quite tell you, but I love coffee themed imagery. That, and, we all need something to get up for in the morning! While I’m not exactly a coffee bean aficionado, it’s a delightful ingredient in a good morning beverage. And it smells great in candle form. If you’re using my creations for your own personal use, all you need is the totally free freebie in the ZIP file below. However, if you’ll be using my work for commercial purposes, on anything you sell, to promote your business etc., you can purchase a license at EchoiaDesign.etsy.com.